Most of you following this blog might have noticed my preference for cooking from scratch. I’ve made some bread recipes before like these BBQ Buns and these delicious breakfast buns with egg inside. As you can see in the first recipe it’s possible to bake some bread on the grid but there are more possibilities I want to explore. 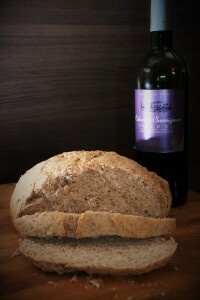 I’ve used the baking stone before I started blogging and got some pretty good results. One day I came across the Dutch Oven Madness blog and got in touch with the idea to use my dutchoven in the baking process. For this recipe I’ve been experimenting with a regular bread dough and tried with little adjustments to optimize the taste and structure. I’ve been through some good ideas but this one’s our favorite up till now. I replaced the regular oil by mushroom infused oil and added some coconut sugar and sesame oil. The Coconut sugar is replacable by other sugars but should be healthier according my wife. The infused oils lead to a slightly fuller flavor. 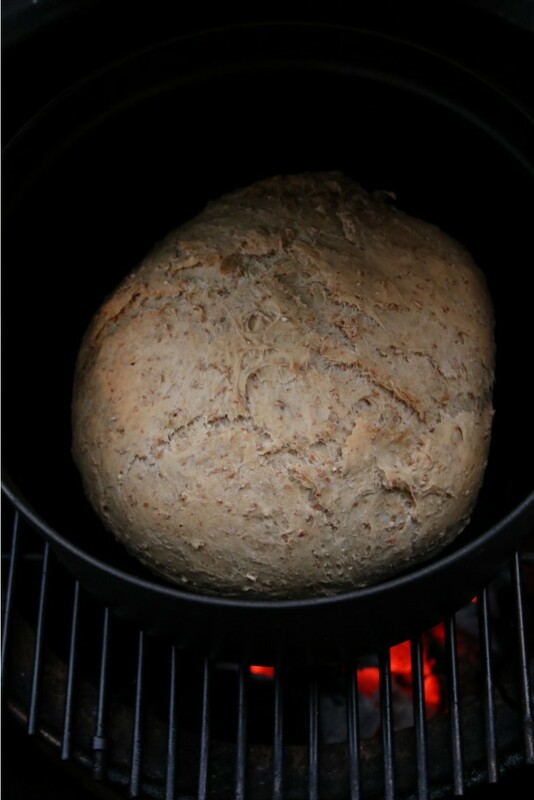 Baking the bread in the dutch oven was a great way to use the waste heat after you’ve grilled your favorite meal. The preparation is not different from baking in the oven. This way it’s perfect for campground breakfast. 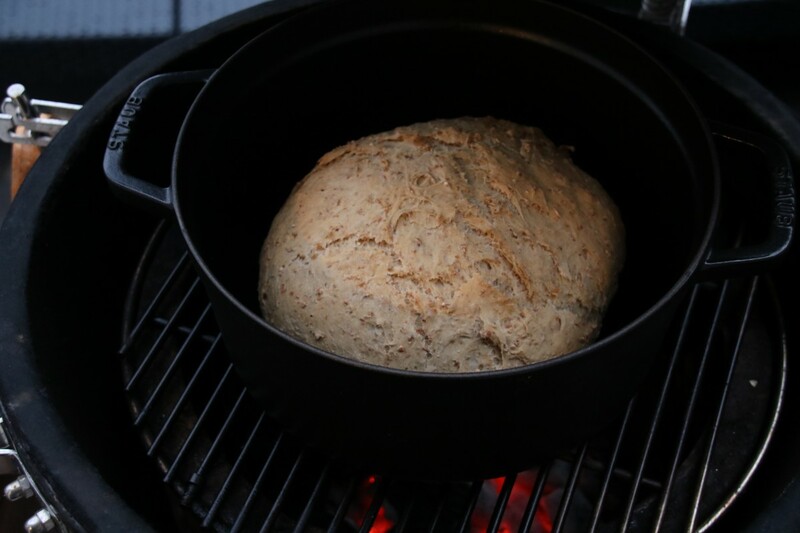 You could perfectly bake your bread while enjoying the campfire the night before. I closed the dutch oven during the whole baking process. It brings a tasteful crust. Yet my mother in law told me she removes the lid and puts her bread back in the oven for another ten minutes afterwards to enhance the crust. I haven’t tested this way but I guess I shouldn’t doubt her experience. Even more… You shouldn’t either 😉 Moreover I found this interesting read that confirms her advice. 1. Take a big bowl and add the ingredients to the bowl. Start with the dried yeast and end with the salt and water. This way you prevent the salt from breaking down the yeast. 2. Knead the dough until it stops being sticky. Add some flour if needed. 3. Put the dough aside covered under a wet towel at room temperature and leave to rise for about an hour. 4. Knead the dough for a second time and put aside for another 40 minutes. Meanwhile you can start your fire at about 180°C/350°F (if needed). 5. 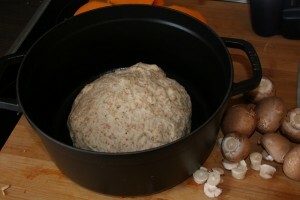 The dough is ready when it no longer springs back after you softly poked it with your finger. Now you carefully shape the bread. 6. Place the bread in an oiled preheated dutch oven and bake for about 40 minutes. The bread is ready when it gives a hollow sound when knocking on it's bottom.